I began seeing this picture of Sylvester Stallone a lot leading up to Super Bowl LII. Sly was like the lead cheerleader for the Philadelphia Eagles and this picture made a nice little tie-in seeing as he had played a little football at Lincoln High in northeast Philadelphia. I love Sly but I was rooting against his team because the Patriots are my team. The underdog Rocky won again. As is always the case when I come across photos like these I wanted to make a card. I had to do a little research to add year accuracy to my card. 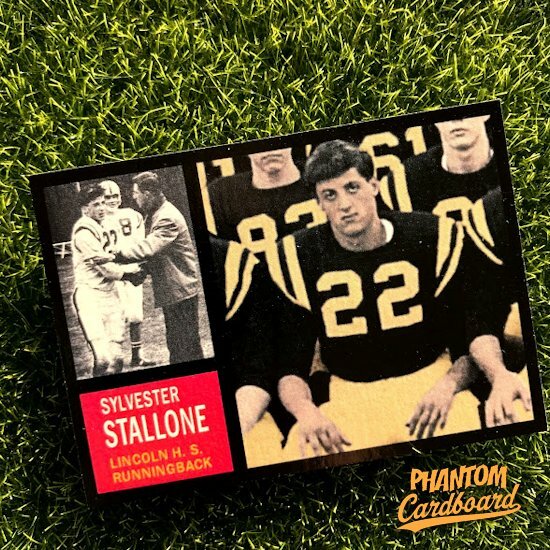 What I found out was that the yearbook pictures shown in this card are from 1962, which is the only year Stallone attended Abraham Lincoln High School as a 9th grader. Sly was a running back and also played a little defensive back. Sylvester excelled on the gridiron and also set track records, but failed every class besides drama. Now that I had a year to go with it was time to look at what Topps was doing with their football cards that year for the template inspiration for my card. It's worth noting that this is now the oldest trading card design I've emulated. The design itself is almost as simplistic as one could hope for. I like that it used two photos; the main photo in color and a smaller vertical black and white photo. As luck would have it there are two Lincoln High Stallone photos out there, one of them being a vertical shot. Unfortunately they are both black and white. That gave me an opportunity to link up once more with my buddy Kristian from kcsdesignz.com to help with the colorization since he did such a great job on the Miss Devlin card. Again Kristian came through for me! The only direction I provided him was that I found that the Lincoln High unis were black and gold much like the Steelers. 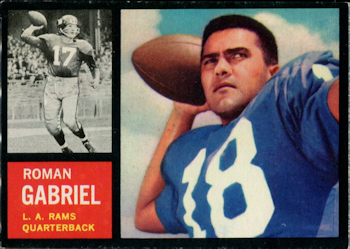 I made the info area of the card to color coordinate with the Eagles cards from that 1962 set. All-in-all I really enjoy the way this one turned out. Probably never get it signed by the man himself, but still worth my time to bring into existence. Really well done. I was wondering what the story behind this was. You have a fine mania, sir.